In 2014, the Sentinel Project launched “Sarus,” its humanitarian aerospace initiative, with plans to deploy “humanitarian drones” in conflict zones around the world. Humanitarian aerospace is one of the cutting edge fields in which the Sentinel Project operates and we now asks for your help through donations to further expand our unmanned aerial vehicles (UAV) program. UAVs used to be commonly associated with government use of armed drones but people around the world have increasingly recognized this technology’s great potential for peaceful, humanitarian purposes. The capabilities of such systems in conflict areas can provide persistent monitoring of threatened communities and enable humanitarians to access areas which would be unsafe or prohibited to personnel, therefore maintaining better situational awareness, warning of incoming threats, documenting atrocities if they do happen, and supporting the delivery of aid to survivors. 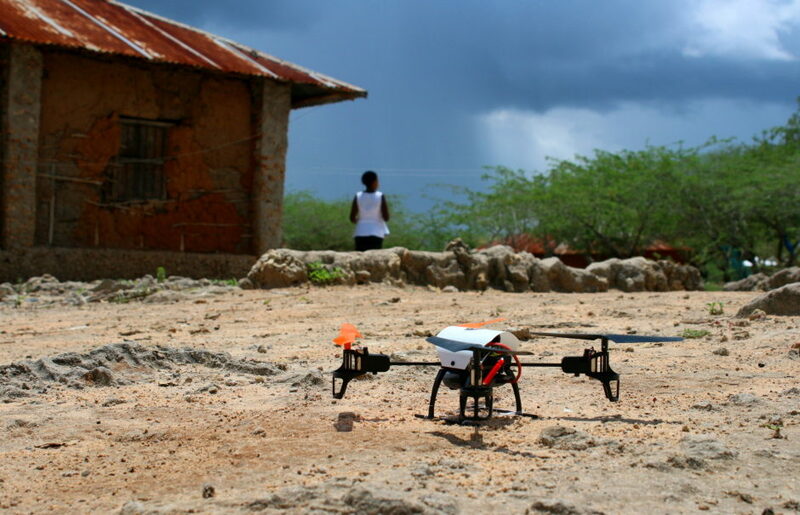 In light of the many benefits that UAVs could provide to humanitarian efforts, this technology has great potential in terms of bolstering the efforts of the Una Hakika project. Una Hakika works to verify reports which have been submitted by the community in an effort to establish whether the reports are true or false. This has been done primarily through telecommunications and in-person fact checking but there are limitations to these methods. Areas which are unsafe for our staff to travel, either due to security risks or environmental hazards, diminish our ability to gather information when time is a factor. UAVs will expand the operating range of our teams on the ground, meaning that a single staff member could be present in one village while acting on a report concerning a village a long distance away. By operating in many places, we can serve the residents of each one more effectively. Large-scale expansion means better small-scale service. Additionally, when fully operational the system will be able to gather information which can be compared in real-time to reports that we receive. Since the launch of this initiative, which was initially proposed to the residents of the Tana Delta, people have shown great enthusiasm and support for the idea of using UAVs to benefit civilians under threat of violence. Community members could immediately see the potential benefits of even as a small-scale pilot project and they were quick to suggest new uses for the technology which would serve not only human security goals but also address other issues which affect the community, such as disaster response or environmental and agricultural monitoring. They have posed key questions about security, safety, and capabilities – which we had hoped and expected – and this discourse has helped to further strengthen the initiative. From the beginning we’ve emphasized input from the community not just in terms of voicing their concerns but also in suggesting new use cases, being able to provide guidance on when and where to deploy, and taking part in air-ground cooperation for tasks such as search-and-rescue missions. This level of community engagement is crucial to the success of our UAV program, since it is designed from the ground up to be a community tool. By donating to the Sentinel Project’s humanitarian aerospace project, you will be supporting the protection of threatened communities while contributing to the innovative new application of a burgeoning technology. For more information on how you can contribute to the Sentinel Project’s UAV program, please visit our donations page, or contact our director of operations and UAV specialist Drew Boyd at [email protected].